Raisins are a popular snack in the United States, with over 317,000 tons produced in 2008, according to the U.S. Department of Agriculture. After studies touted the health benefits of the resveratrol found in red grapes, there was hope that dried raisins would also contain levels of this beneficial antioxidant. Although researchers found that resveratrol content in raisins varies and tends to be minimal, raisins still contain enough fiber and nutrition to make them a healthy snack choice. Resveratrol is a type of antioxidant, a compound found in fruits and vegetables that fights harmful free radicals in your body that cause chronic health conditions. Resveratrol is also classified as a phytoalexin, a class of plant antibiotic chemicals produced as a defense system against disease. Resveratrol is found primarily in the skins of red and purple grapes and the wine made from those grapes, as well as blueberries, bilberries, cranberries and peanuts. Red grape skins have the highest concentration, with 50 to 100 micrograms resveratrol per gram of skin. Interest in resveratrol surged in the 1990s when researchers tried to discover the reason behind the "French paradox" — why French people had low rates of heart disease despite a high-fat diet. They settled on resveratrol in red wine as the likely cause. Since then, various studies have determined that resveratrol inhibits the clumping of platelets that can cause blood clots and improves cholesterol profiles. Resveratrol is also able to prevent the development and growth of several types of cancerous tumors in the lab. Tests on mice show resveratrol's promise in increasing survival rates and lowering the incidence of conditions associated with aging, although these results haven't been tested on humans and are controversial. According to the California Raisin Marketing Board, California raisins are made from seedless green grapes and don't contain significant amounts of resveratrol. The sun-drying process of raisins also reduces resveratrol content due to oxidation, although raisins cured indoors maintain higher levels. A review in the "Journal of Food Chemistry" in January 2010 reported that golden Thompson seedless raisins cured with sulphur dioxide instead of sun-drying had higher levels of phenolic antioxidants. Even so, only one of the 10 raisin cultivars researchers analyzed, known as B53-122, had any measurable amounts of resveratrol. Further complicating the ability to determine resveratrol content in raisins is the environmental stresses during the growing process that affect amounts of antioxidants in grapes. A few companies produce raisins made from red grapes, although these raisins have not been the focus of studies to see if they have higher resveratrol levels than the more widely available raisins made from green grapes. However, since red-grape products have greater resveratrol amounts than white-grape products, seeking out these raisins might be worth the effort. 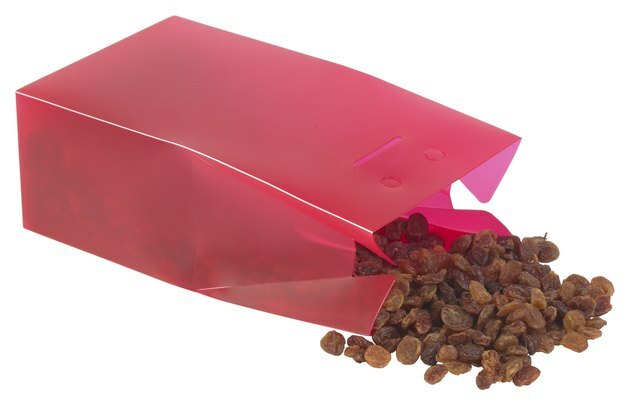 Some health-food stores also offer raisins that are cured indoors rather than outside, which would improve resveratrol levels. You can try drying your own red and purple grapes at home using a dehydrator. Quackwatch.com; Resveratrol: Don't Buy the Hype; Stephen Barrett, M.D. Is Nutrition Lost When Nuts Are Roasted?